The SDSU/CGU Joint Ph.D. Program in Education offers the benefits of a large, comprehensive public university and a small private univeristy with a transdisciplinary emphasis. 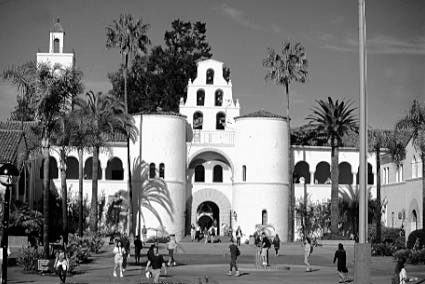 Established in 1897, San Diego State University and the College of Education have been committed to excellence in the preparation of educators for more than a century. San Diego State University is an academically rich, urban university that provides endless possibilities for students. SDSU offers bachelor's degrees in 81 areas, master's degrees in 72, one educational specialist degree (Ed.S. ), research doctorates (Ph.D./Ed.D.) in 14 areas, and one professional doctorate (Au.D.). San Diego State University has an enrollment of nearly 34,000 undergraduate and graduate students. The College of Education is one of seven colleges within the University. It is the major teacher education institution for San Diego and Imperial Counties, preparing half of the area's teachers. The College offers graduate study leading to the Master of Arts in Education degree with concentrations in counseling, educational leadership, educational research, educational technology, elementary and secondary curriculum and instruction, reading, special education, and policy studies in language and cross-cultural education. Each year more than 1,000 students complete credential or masters degree programs through the College of Education. In a typical year, ten graduates will be awarded the Ph.D. in Education through the SDSU/CGU Joint Doctoral Program. Claremont Graduate University is like no other graduate-level university in the nation. Founded in 1925, CGU is an independent institution devoted entirely to graduate study. At CGU, students are encouraged to pursue academic research agendas both within and across traditional curricular boundaries. As a member of The Claremont Colleges, a consortium of seven independent institutions, CGU is able to offer a greater breadth of faculty and campus resources than is typical of a university with 2,200 students. Claremont Graduate University is classified by the Carnegie Commission on Higher Education as R2: Doctoral Research University, Higher Research Activity. Many of our academic programs are practice-based, so students start working in their field even as they’re learning. Enrollment is limited and classes are small, so our scholars receive individualized mentorship that expands their vocational network and prepares them for remarkable careers.